It is nice to do this once a year or so, to see who is still hanging around. We have allot on members who are just readers.They still stop in and check us out. We have a few members, like my self who post quite a bit. We are comming to the end of yet another vanning season. 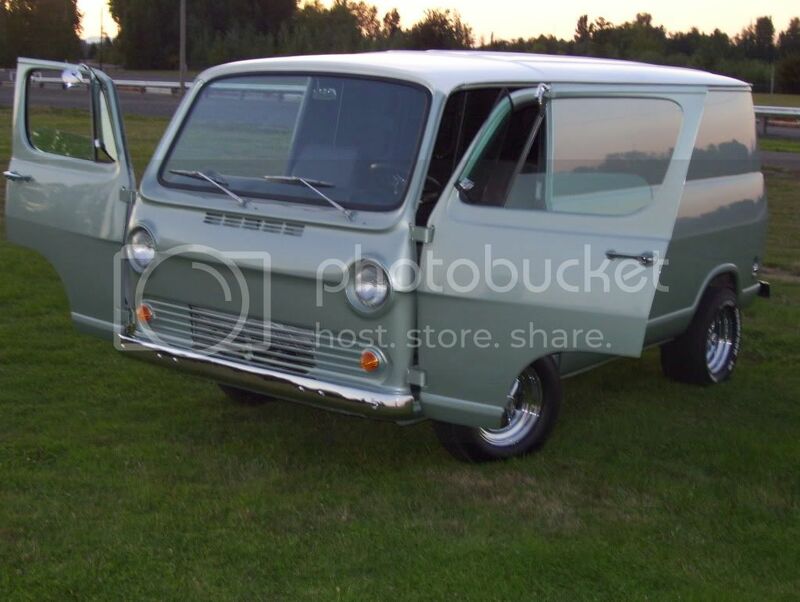 Chime in, and let us know who you are.A little about your self and you van or vans. 1....Wookee retired welder,professional Pap Pap. Proud owner/ builder of the "Beast"
and it's younger brother a Mid 3rd gen GMC Van "Daily Driver" I like to call the "Beast of Burden"
Its a "van thing" A life style you have to live to understand!!!! I'm still here and look forward to getting more & more involved. My PB2 Restoration has been on hold, however, if things go as planned and I sell my $boo-koo$ dollar `70 BOSS 302 Mustang here soon PB2 will move to the front burner and be done ASAP!! But first, I also have my Son's 3rd Gen that is really close to being finished and I want to get it done for him. This is a great site and I enjoy reading posts and have already been able to locate many parts I need for PB2 along with making a couple really good new friends. I'm here. Duh, like ya'll didn't know that. 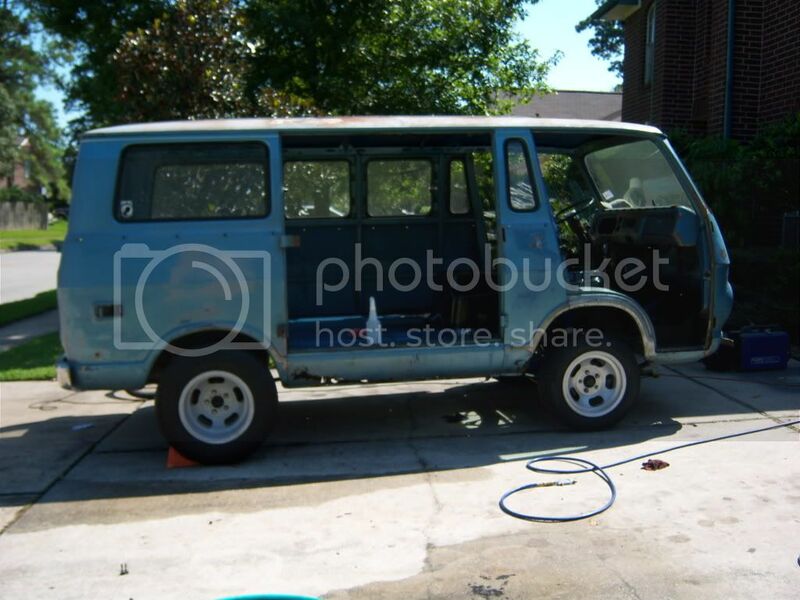 Well I started posting a little over 1 year and a half ago starting the rebuild on my 68 Short wheel base sports van. Haven’t posted in a long time so here is an update of my progress. The 350 small block is completed, The undercarriage is completely redone and I actually cranked it up and drove it around the block. Man that 350 sing's. So I loaded it up on a trailer Sunday to get it to the body shop. Had to take the hot rod wheels off the back and take the wheels off my 67 in order to get it on the trailer. Now both of them look stupid, but hopefully in a couple Months my 2 year project will be 80% done. Will post some picks soon. 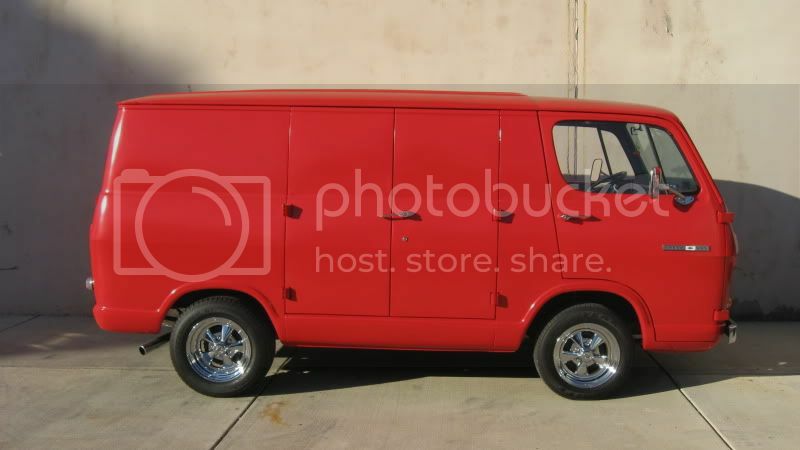 Thanks to all who helped me out early on, as everyone knows everything about these vans mainly needs to be fabricated yourself, thus time consuming. Can’t wait though, and hope to be at a NAT someday soon. I'm Dave. I just turned 50, and I bought my van when I was just about 20 to haul around my musical equipment. It's not beautiful, but it still runs, with remarkably little maintenance in the last 30 years. I have two daughters, a wife who's a busy professional, do most of the shopping and cooking, and a run a business from home, do the marketing for it, and service a sales territory which includes all of North America with Australia and New Zealand thrown in for good measure. 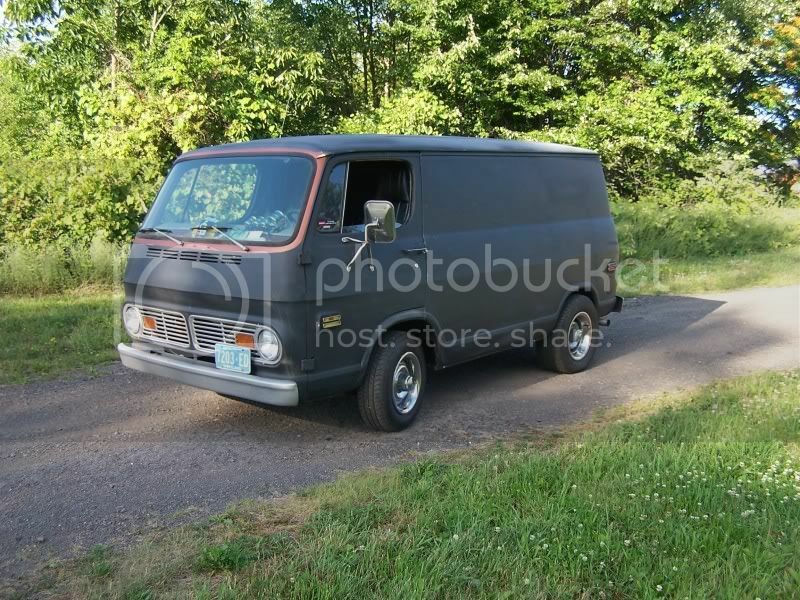 Driving my van provides me a way to connect with a simpler time in my life, when playing and listening to music, righteous bud, and the company of young women were my main motivations in life. i'm still here as well. i'm a 33 year old middle school latin teacher. i've always been a car guy. my dad and i have been working on a '65 mustang and a '52 ford panel truck for a few years (i've also had a '68 cougar and a '79 cj7 over the years). my wife is a vet tech and as such, we have more than our fair share of furry critters. that is what originally set me on the search for a van (a critter transport). 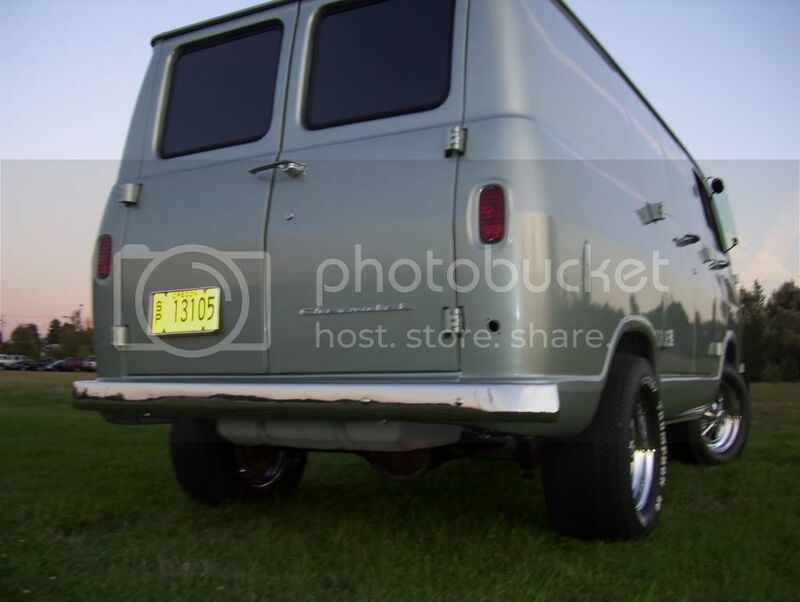 my folks had a series of 3rd gen chevy conversion vans (79, 85 and a 90) which i loved and drove as a pup. i was searching for a 3rd gen when i came upon my '65 for sale. immediately my search was over. i got it for $500 and put another $700 or so in it to get it road worthy and though she is not pretty, she has been a very reliable mode of transportation and i just love driving her. as a matter of fact, i drove her to work this morning. i alternate between the van and a 1989 dakota for daily driving duties and my wife and i both hope to make to a few nationals very soon (she's a van fan as well... in fact, some of you may remember, we used our van in our wedding two years ago). i'm going to try to start the body work this winter. i'm collecting panels and should be able to get the rest from the mill supply co. hope all is well with everyone and i want to thank you all for the advice, assistance and parts you have offered and supplied. none of this would have happened without you. viva la vcvc!! Hi everyone, I've enjoyed the 66 panel in the latter part of the summer, taking it to a few cruises and used it for transport all my old parts to a local swapmeet. The GF and I almost took it to a long distance cruise but I couldn't get the rearend finalized by then, bummer. 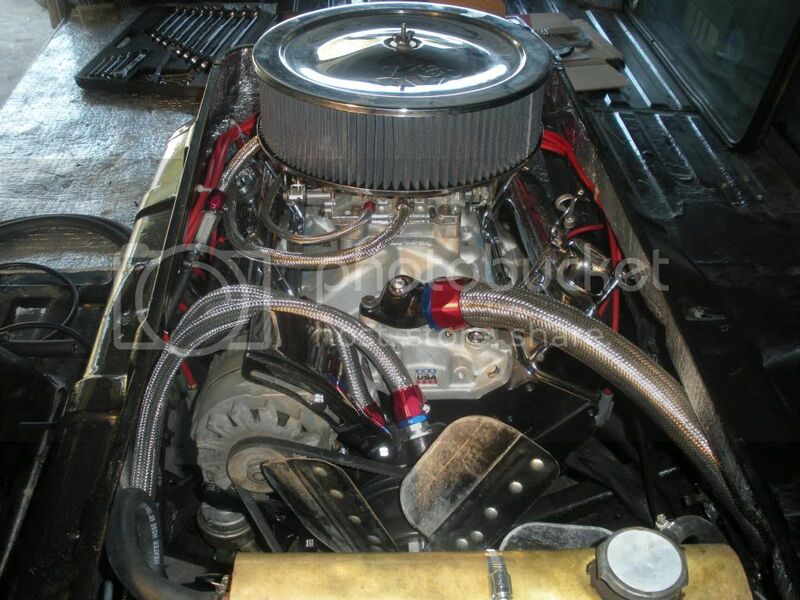 The rearend is a 12 bolt 3.07 gearset out of a 68 chevelle and really helps on the highway. Had to pull the cragars off because of the offset wouldn't clear the inner fender, another bummer. Plans are to purchase another set with a 2 1/2"offset. Been laid off for 7 weeks and just completed a complete on a 73 chev C20 camper special with a 454. Now I've got a little too much time on my hands so I'm searching for work which for the last 26 years has been an HVAC mechanic/installer. I've been thinking about starting a new career in the restorating field but just have to shake the nerves and do it. Overall it's been a great year and hope to get some more seat time in the van next summer!